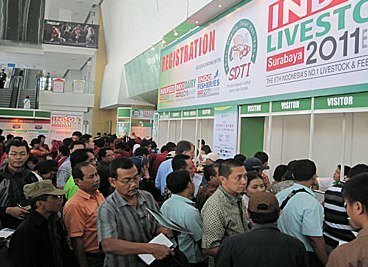 The three-day expo, billed as Indonesia’s largest livestock trade event, will open on 4 July at Jakarta Convention Centre, Jakarta. More than 10,000 trade visitors are expected to converge on the mega fair. “Recognized by the industry as the leading livestock and feed industry expo, Indo Livestock Expo & Forum is dedicated to deliver maximum return to exhibitors and participants. Our commitment is reflected in the high quality of visitors and unmatched exhibitors’ record,” a spokesperson for the organisers said. The event serves as an ideal platform for integrators, manufacturers, farmers, veterinarians, feed millers, food processors, research institutes and industry experts across the region to source for new technology, build partnerships, look for new investments and keep themselves abreast of current developments, according to the organizers. Indonesia’s livestock sector has undergone a significant structural change from the traditional small-scale backyard farming to large integrated farms that employ technology to enhance efficiency and bio-security. The livestock sector is currently dominated by poultry farming with the ruminant sub-sector being substantially smaller. This change has resulted in huge demand for modern farming systems, improved breeding conditions and better animal nutrition and health products. Furthermore, the downstream meat processing industry has also seen strong growth rates amid higher domestic demand and exports. “The event is perfectly timed to capitalize on the tremendous business opportunities in Indonesia today. And all those who participate in the expo will benefit from this excellent marketing platform to promote their products and services to the people that really matter,” the spokesperson said. According to the organisers, in the previous edition, 82.4 per cent of the exhibitors rated the quality of visitors as good or excellent, while 82 per cent rated the show as successful.